At the start if January, I had intended posting my New Year's Resolutions. And then, by the time we were back from travels over the festive period and into the new year, the kids had gone back to school, and general business, it somehow didn't happen. This does mean that my New Year's resolutions have distilled themselves into a more manageable list. So here goes, these are my slightly belated New Year's Resolutions. Several years ago I set myself the target of reading 50 books in a year, and somehow, through a combination of not being able to knit while feeding a baby and being up in the night a lot, I managed it. Since then I haven't read anything like as much. Two children seem to keep me pretty busy, but they're getting bigger, and I am starting to find more time to read again, so 26 books seems like a realistic target. I've also added the Goodreads app to my iPad, so hopefully I might have more success recording what I'm reading than I have in recent years. I'm on target with this one so far - at the time of writing I have finished reading three books, which is actually ahead of target! ...or crochet, and any yarn coming in and out of the house. In theory this should be pretty easy. My personal projects are generally up to date on Ravelry, it's the commissions and third party publication projects that fall through the gaps - I have to keep a lot of them out of them private for several months before I'm allowed to share them. A friend gave me a special project notebook for Christmas, so I think I have a fighting chance of keeping up this year. There is a pretty constant flow of yarn into and out of our house. It's pretty inevitable when my job involves a lot of knitting. But I do also have a huge personal stash, and really have no need to buy any more yarn this year. Obviously I will still have to acquire yarn for many of the patterns I publish (my stash is bad, but I don't generally have a blanket's worth of yarn in one particular brand and weight of yarn, and magazines usually want new patterns in something very specific). I am hoping that by doing this I might be able to reclaim a few of the cupboards in our house for things other than yarn! I am guilty of spending far too much time working, and not enough time playing with other crafts and non-work knitting. I think these things are important to avoid burn out, and to learn how other people do things. The other thing I'm guilty of it knitting vanilla socks when I should be working on work knitting. So non-work knitting is now consigned to weekends, which should hopefully mean I work more efficiently during the week and get a few more personal projects finished. Both my kids are getting to the stage where their baby blankets are a little on the small side, so the time has come to knit each of them their very own special blanket. 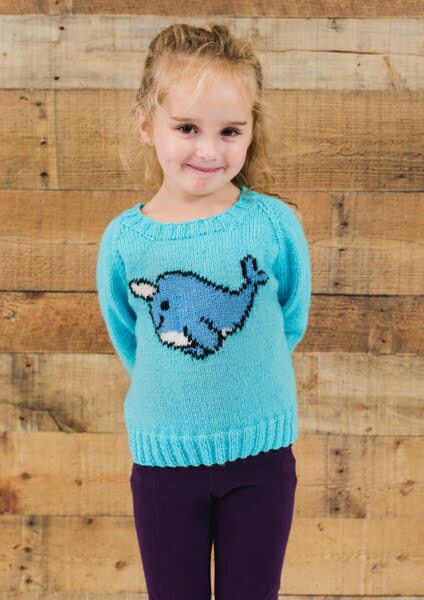 My daughter's is already planned, I just need to write the pattern and get knitting. My son's might be a little trickier, but I suspect will end up featuring something along the lines of Star Wars characters. You might remember that this was one of my aims for last year, and that while I shared several pictures of a part-knitted Pavement Sweater, I never shared any pictures of the finished garment. Well I did finish it, and I wore it to Yarndale. But since then it has been shoved in a box. It turns out there are too many things I didn't like about it (it's too long, the neckline is too wide, I don't like the looseness of the fabric, and sleeve increases combined with the fit create a weirdly large amount of excess fabric under the arms), so I think I'm going to unravel it and do something else with the yarn. Instead I am going to use some other (heavier) yarn and design and knit myself a jumper. It's going to take a bit of experimentation and quite a lot of learning, but I'm pretty sure I can do it. And if don't try, I'll never know! Do you have any New Year's Resolutions? How are they looking at the end of January? *Pattern is Fluffy White Clouds. Hello! Hope you're having a lovely Sunday. I have somehow stuck to my resolution of only working on personal projects at the weekends, and both my business crafting and hobby crafting seem to be benefiting. I am currently working on a lot of baby knits, either on the needles, or just in the back of my mind. In the current academic year (September to August) 7 babies will be making an appearance*; in my experience babies do seem to come in clusters, but this is a pretty extreme one! So a lot of my weekends will be spent knitting baby garments. I love knitting for babies: the garments are so small and cute. They allow a chance to try new things without having to commit to weeks of knitting. The current baby knit on the needles is a heavily modified Rainbow Child**. I'm knitting it in 6 months size as the baby is already here, and I definitely want it to get some use before it is outgrown! All the blue yarn I'm using is Paintbox Yarns Baby DK,*** while the cream is some long-stashed Sirdar Snuggly DK. **** The yarns are working really well together and I'm enjoying the project. I'm hoping that I might even have the whole thing knitted by the end of the weekend (but it is possible I said that last weekend as well and that clearly didn't happen), but a bit of a mishap knitting the hood means that’s looking less likely! Not the greatest progress for one day! As for books, I finished the Sarah Millican book before last weekend and loved it. I laughed out loud so many times that my children thought I was mad. I'm now onto Hidden Figures by Margot Lee Shetterly (you may have come across the film based on the book; it was out in 2016 and I plan to watch it when I have finished the book) about the role of black American women in the space race. I'm finding the book interesting, but a little slow - this is not one for bedtime as I tend to fall asleep. What are you working on at the minute? 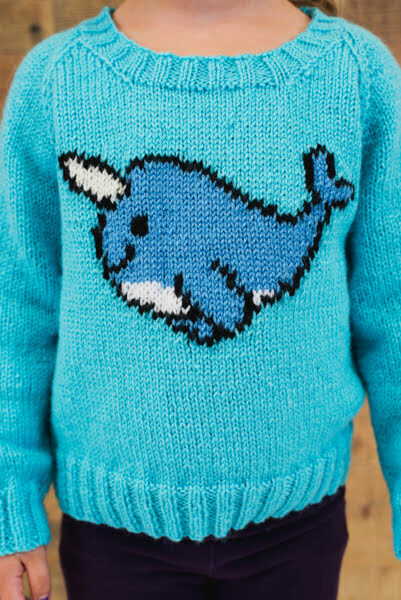 What are your favourite things to knit for babies? *And that's only the ones close enough that I plan to make a gift for them! **I have used a different stripe pattern, omitted the i-cord edging, and am not knitting the pockets. ***Supplied by Paintbox Yarns for review purposes. Affiliate link. There's a new issue of Knit Now magazine out today, and I have not one, but two new patterns in it! First we have my Contorto socks. One of my favourite ways of showcasing stitch patterns is to knit them into socks; by the time you have got to grips with the stitch pattern you are ready to tackle the heel, so socks always have something interesting going on, even if the pattern is the same throughout the sock. I found this stitch pattern in a stitch dictionary while looking for something else entirely and couldn't get it out of my head! I've named them Contorto, which is Italian for twisted, after the beautiful twisted cables in the stitch pattern. The socks are knitted from the toe up with a heel flap and gusset construction. The heel flap features a slipped stitch pattern for reinforcement, while the sock features a heavily cabled pattern on the top of the foot and around the leg. The socks are finished with a cabled rib pattern. The socks are written for three sizes and finish at long-ankle to mid-calf length. The foot length is adjustable to fit. My Contorto socks are knitted in Debbie Bliss Botany Lace,* a high-twist merino yarn that comes in a variety of semi-solid and variegated shades. The socks would also look amazing in a solid shade of yarn, which would really let the cables pop. You can knit the first two sizes using a single skein of the yarn (the largest size may require a third skein if the recipient has long feet). The second pattern is my Love cushion. My 'love' cushion is a bright and bold cushion featuring the slogan 'love' across the middle. This pattern is perfect for Valentine's Day. The pillow is knitted in a single strip, starting with a section of 2 x 2 ribbing, then some stocking stitch for the back, the front is knitted in stocking stitch with the word 'love' incorporated using intarsia. The back is then knitted, finishing with a section of 2 x 2 ribbing featuring buttonholes to fasten the pillow cover. The side seams are joined using mattress stitch. The cushion cover is the perfect size for a standard IKEA long cushion. The cushion is knitted in Rowan Pure Wool Superwash Worsted,** which is beautiful to work with and very hard-wearing, as well as being machine washable. If the colours used in the sample aren't quite to your taste, why not try some of the other shades available? There are plenty! If you want to knit either of these patterns, you'll need a copy of Issue 84 of Knit Now magazine. The magazine is available in supermarkets and newsagents, or you can order a copy online. If anyone knows where the weekend went, can they let me know? I swear the bit between Friday evening and this morning just disappeared. I did do some lovely things with my family - we went for Sunday lunch at a farm shop and went to Shildon Railway Museum to see Tim Peake's space capsule - but otherwise I think we all slept quite a lot! I do have a bit of knitting to show for my weekend though: I finished my Selbu Mittens, and they're pretty fab. They're currently blocking and will have their own FO post on a Friday, but here's a sneak peak. I also managed to get a couple more stripes done on my Mind the Gap socks. I hadn't worked on them since New Year, and miss them a bit. The stripes are very motivational! I also cast on a hoodie for a friend's new baby, but 8 rows in I had already cast on twice and got the stripe pattern wrong, so unravelled it and put it back in the bag to look at next weekend. Today has had plenty of missed knitting opportunities. I went to soft play with my daughter, but failed to take any scissors, which are pretty necessary for intarsia knitting! And I would have knitted while the kids were swimming, but there were no seats (the January effect: New Year's resolutions always make for busier swimming sessions!). I'm going to catch up this evening, assuming I can get the kids to bed before I'm ready to fall asleep - while we're well past the shortest day, the weather has been gloomy for days and it's making me tired! As for reading, I started Sarah Millican's autobiography last week, and am enjoying it. Part autobiography, part self-help guide, I have laughed out loud while reading this so many times already and I'm only a quarter of the way through. I had requested this for Christmas, but got book tokens instead (not a bad thing, I love book tokens). At my earliest opportunity I popped into town to pick up a copy, only to find that everywhere in town had sold out (Sarah Millican is from Newcastle, which is very close to Durham), so had to wait until I headed south over the Christmas holidays. What are you crafting on and reading at the minute? You might have noticed a small change to the title of this post; Ginny has restarted her Yarn Along series of posts, so I'm linking up with that (her posts are now monthly). 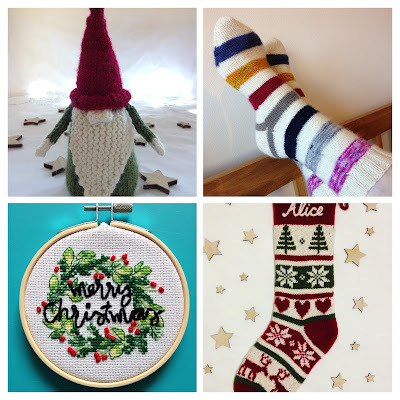 December got rather busy and I missed out of writing several FO Fridays, so here is a round-up of all the things I finished in late-November and December! First up we have a Merry Christmas hooped embroidery. I bought the kit for this at the end of 2016, thinking it would be a nice quick project. One Sunday afternoon I sat down to work on it and very quickly realised that it might not be quick as quick as I had hoped! The next problem was following the chart: the chart had both symbols and colours, which should have been fine, but the regions of green were very scattered and I found it really hard to keep track of what went where. I had done about half the kit when I realised that the first half didn't line up with the second, at which point I took a photo of the chart and printed it out in greyscale as large as I could. I then coloured each square as I checked that it was correct. A little bit time consuming, but it did mean I only had to unpick a few stitches rather than the whole lot. And when I finally got onto the outlining I discovered that the photo on the front and the chart didn't actually match! And I ran out of black thread... So I improvised a merge of the two and I think it turned out pretty cute! The final hoop was sent to my advent calendar secret Santa swapee. I am hoping to do some more cross stitch this year, but I'm going to be a bit more careful on choosing the kit! A few years ago I made a stocking for a friend's daughter, and last year she had a second daughter and requested a matching stocking. It took me a little hunting to find my original notes, but once I had this was a lovely project. I knitted it in Drops Alaska, which is fabulously woolly, and the yarn comes in perfectly festive shades of red and green. There will eventually be a pattern for this, but I want to make a few modifications so keep your eyes peeled. This was one of my favourite projects of last year, and definitely not one I was planning to make. During the Giftalong, these little gnomes kept popping up in the finished object thread and I fell totally in love with them. The pattern is Never Not Gnoming by Sarah Schira, and it's a super-quick knit - I finished this one in a couple of evenings using the leftovers from the stocking. Last year I took part in a secret Santa advent calendar swap, and over the course of December I knitted this pair of scrappy socks. I am not necessarily a fan of scrappy socks, so I decided to stripe the calendar yarn with a neutral (West Yorkshire Spinners Signature 4 ply in Milk Bottle), but this did mean that I had quite a lot of knitting to do each day, and got several days behind, hence there being only one pair of socks, featuring rather fewer than 24 colours! I did enjoy making these though, so might make another pair in the future. 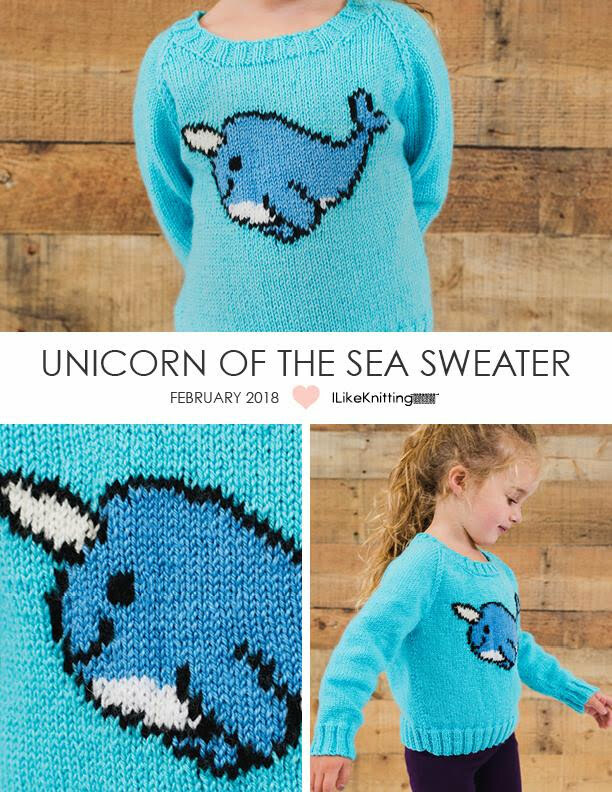 Last year, I Like Knitting magazine put out a call for submissions for designs featuring cute creatures and mythical beasts, and this is what I came up with, my Unicorn of the Sea Sweater,* which features a cheeky-looking narwhal. Narwhals are my favourite of the 'mythical' beasts, mostly because they are real - I love that they are so implausible! 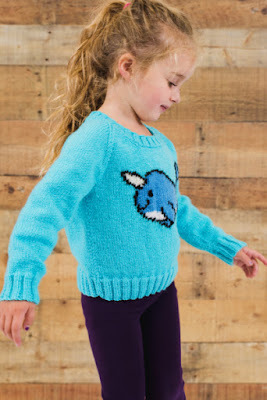 The Unicorn of the Sea Sweater is knitted flat from the bottom up in sections that are seamed before adding the neckline in the round. The jumper is knitted in stocking stitch with 2 x 2 ribbing for the cuffs, hem and neckline and the narwhal motif is added using the intarsia technique. The pattern is written in 5 sizes: 2 (4, 6, 8, 10) years and is designed to fit with 5 cm [2 inches] of positive ease. 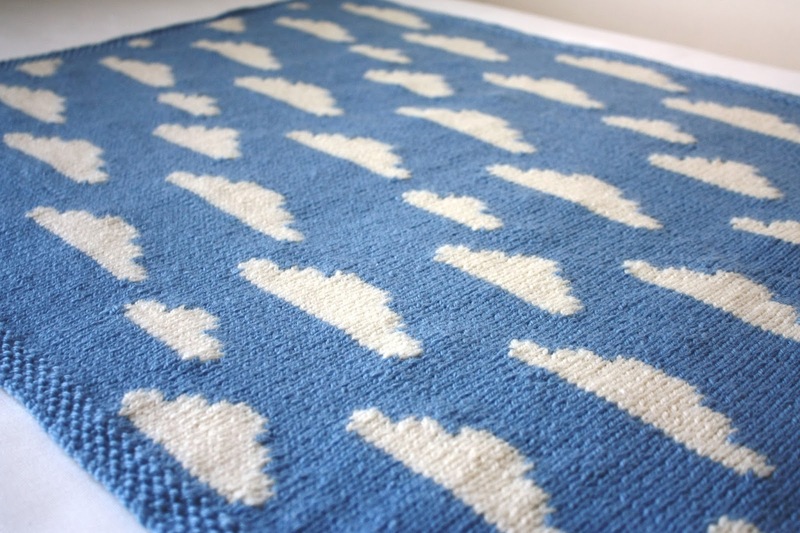 Want to queue the pattern on Ravelry? Click here. All images copyright I Like Knitting magazine. One of the things I want to do this year is to knit more patterns written by other people: most of my knitting is work knitting, and sometimes I think it's good to look at things from a different perspective and to try out new techniques. With this in mind I've decided that, where possible, weekends will be dedicated to non-work crafting. Late last year, lots of knitting podcasters (Woolenvine, Stranded, Tea and Possibilities to name but a few) were talking about knitting Norwegian style mittens. It wasn't something that had specifically appealed to me before, but after watching so many people talk about them, I started to think it might be something I was interested in. During the Giftalong last year I discovered designer Erica Heusser, who has designed some beautiful colourwork mitts and mittens, and I decided that I really, really wanted to knit her Songbird Mittens. I put in an order to Knit Picks for some of their Palette yarn (which is perfect for colourwork), but when it arrived, I got a little intimidated: stranded mittens in 4 ply yarn at 40 sts to 10 cm, what was I thinking?! So I started looking for something a little simpler. After a quick search on Ravelry I decided that the Selbu Mittens by Skeindeer Knits might be a good starting point - they're knitted in DK weight yarn, and come with full instructions (so many patterns for Norwegian Mittens are just the charts, which I'm sure I'll be fine with after a little practise, but maybe not for my first mittens!). I had DK weight yarn to hand - Willow and Lark Woodland - but when I sat down yesterday to cast on, I quickly realised that the yarn was much too thin, and that I would need something a little bit thicker. One of my New Year's Resolutions is to do all non-work knitting from stash, so having decided that the yarn I had to hand wasn't going to work, I stepped away and got on with something else for a bit. It was only later in the evening that I realised I had the perfect yarn in my stash, an odd couple of balls of DK weight Bluefaced Leicester that have probably been in my stash for five years. Having found the right yarn, I decided to jump straight in and cast on the mittens (yes, I should have done a gauge swatch, but a stranded swatch in the round isn't far off knitting a mitten, in terms of time and effort). I immediately loved knitting the mittens, the pattern was pretty intuitive and before long I had knitted a decent portion of mitten, and even better, the gauge was perfect for making mittens in my size! This morning at soft play I even managed to get to the tip of the first mitten! I am really excited to get the second mitten knitted and on to my hands! Another resolution for this year is to read 26 books. I'm doing pretty well so far as I've already finished the Susan Calman book (which was brilliant) and am now reading A Very Distant Shore by Jenny Colgan (it's a short book that is set on the same island as The Summer Seaside Kitchen, which I read last summer). The book is good so far, focusing on the arrival of a new doctor (a refugee, whose medical training is his ticket out of a war torn country) on a Scottish island. I'm sure it's not going to take me more than a couple of days to finish the book, then I might move on to one o of the books I got for Christmas - there's quick a pile! Hello, and Happy New Year! I hope this finds you well and that you had an enjoyable festive period. I'm still in a bit of a festive limbo - Christmas and new year are over but the kids are still off school - I'm spending a lot more time playing board games and eating biscuits than knitting! I have done a bit of knitting, and am starting to step up the business knitting again, but am generally working on slightly more mindless knits that don't require any concentration. One of the things I have had time for over the Christmas break is thinking about how I want to proceed with this blog; over December the blog got a little neglected as other things took priority, so I feel it needs a bit of redirection for the new year. With that in mind, this is going to be the final Yarning Along on a Wednesday. Wednesdays have never worked that well for me as I tend to spend my weekdays working on business knitting, so Yarning Along is moving to a Sunday, which should make the posts a little more relaxed. I'm also considering creating a few more blog regulars, so watch this space! My current major knitting project is these fabulous Mind the Gap socks, which I cast on as part of Little Bobbins' Christmas Eve cast on. The yarn is from Trailing Clouds is fabulous - the stripes are in the colours of the tube lines on the London Underground tube map and create a 12 stripe repeat. Each dye lot is dyed with the stripes in a different order, which makes each skein even more special. I've done the heels and cuffs with West Yorkshire Spinners Signature 4 ply in Milk Bottle, and plan to do the same for the toes. I've also decided that I'm going to knit the second sock with the stripe sequence reversed so I don't waste any yarn between socks. I'm really excited about these socks and can't wait to finish and wear them! I'm currently reading Susan Calman's Cheer Up Love: Adventures in Depression with the Crab of Hate. This book is brilliant; it is autobiographical, but frames each of the periods of Calman's life in the context of her relationship with her long-term depression (which she refers to as The Crab of Hate). The book answers a lot of questions about depression, but in a light-hearted way, and I have spent a lot of the book laughing out loud. I would really recommend this book. As ever, linking up with Rachel for Yarning Along. And I'll be back on Sunday with another Yarning Along! For now, happy knitting.